Can you tell us about the cuts, those thick layered paintings into which you literarily dig trenches? Yes, the cuts make up the latest body of work that I introduced in the last two years. They are similar to my drill pieces; it is the same procedure, the same process. The resin gets layered on a wooden support, and when the piece seems to be thick enough to do something with it, I think about the last color which is going to be the top layer. The layering gets built up to a thickness of about 3 cm, so a painting can become quite heavy, it gets almost sculptural. About 10 years ago I had already done a group of pieces that were cut with a hand router, but at that point my focus shifted to another process. I also went outside the studio to use CNC machines (editor’s note: Computer Numerical Control) to cut paintings, but I was not totally satisfied with the outcome, I had to work by hand and push a little further from what came out of the machines. I liked the end-result but I did not like the CNC process so much because I had to involve people to program and to run the machines, all very time consuming. On top of that, there was no way to interact with the piece once it was being processed by the machine as the predetermined program just runs through. As I was thinking about how to use the router without a CNC machine, one of the carpenters I work with […] told me he had this table with a router that gets pushed by compressed air. He offered to set it up for me in the studio with a compressor, two joysticks for directions and a foot pedal for up and down, and we tried it out. I have had it for about 2 years now and it is a very unique instrument to shape paintings. It is industrial in a way but it is also a stone-age routing technique because the air does not give you the same kind of smooth cut as a CNC machine. It is a little bit like riding a bucking donkey. So you have things that can happen like the pressure of the air that pushes the router too far or too fast or in a direction that you did not anticipate, so you have to deal with the accident that the machinery provides and I find that very interesting. The process is in a sense like drawing with joysticks. I like to explore the tools I have, their possibilities. The first group of cuts had a more organic drawing layout and lately I did a group with zigzag patterns. For the zigzags, it’s like setting up a system and then the router/compressor has its own mind and adds mistakes and these fails become part of the piece that I have to react to in the rest of the process. I am now working on a few little pieces where the last layer is in different colors. I set the cuts where the colors meet and it gets really confusing because it is hard to identify where the top layer and where the cuts are. It becomes an exercise of precise viewing of the object that is in front of you. Is there any intended reference to art history in these paintings, because you are literally excavating paint? I don’t know, the painting processes have always been about adding and subtracting, either with a brush, by scrapping paint off or by taking a rag and wiping it off. The cuts are an amplified version of these painting processes. Yes I work with epoxy resin and if you accumulate it, it gets so three-dimensional that you can actually make sculptures out of it. I have different groups of sculptures. Right now I am working on a sculpture where I use a soft translucent vinyl as a mold so I can see what the sculpture looks like while I am building it. It is like a soft bowl where I pour layers in and I will eventually take the vinyl away and get the pure resin sculpture. It is very interesting to see how it grows and expands into its final shape. The form is not predetermined but part of the layering process. 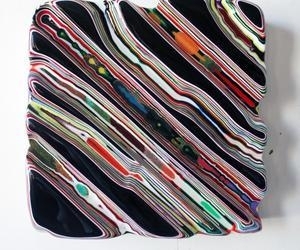 In some of your sculptures, you also use resin that is recovered from your paintings? I also created another body of work with remnants. The drip paintings create things like puddles, so I was thinking that I could use those puddles as layers for paintings that I would later drill in or cut into. So I built armatures on the walls so drip paintings are not like before painted hanging right on the wall. This leaves enough space underneath to have another painting laid on a dolly and rolled around to recover the drips. In these paintings, I change the way I layer, I create blobs and pour into blobs and all kinds of stuff and in the end each layer has several colors, not only one color… In the drill pieces, every drilled circle is a little painting on its own. I like to create visual overload, I like the idea that when you are confronted with something you have to carefully explore to really understand. The memory of the past is very present in your work. Is your artistic practice nostalgic? I wouldn’t say it is nostalgic at all but the aspect of time is very important. Time is crucial in our lives, the way we change over the years, what age means, and all of that… You cannot live without thinking and reflecting about it. Some of the best art in every genre is related to that. I had a body of work where I used actual little printed photos, before everything turned digital. I would look at the piles of printed photos that people used to have, younger people don’t even remember that anymore. It was piles of personal history and memory. So I just started to take mine and assembled them, collaged them together and painted on top of them. When I got my studio here in New York, I met Anthony Accardi from Green Rhino who was able to do big prints from slides. He did photography for artists, back in the days he did a lot of photos for famous artists, he had a very flourishing business. The business is gone now because everybody has its own equipment. Anyway he started to make C-prints from little slides from my Dad’s archives. My dad was traveling a lot, taking a lot of photos. So I took up a different way of painting on top of photos. All my larger pieces with images are from photos that my Dad took. And the time aspect popped up again. You would look at an image that was taken in Pakistan in the eighties, and how a personal work-related travel image becomes political over the 40 years of its existence. There is a lot of ambiguity between the personal and the political, they are very connected, hard to distinguish. The drips running over these pieces create like the curtain of time that has passed since my dad pushed the trigger of his camera. Using the example of the Pakistan picture, how do you chose the color of the paint that is going to drip over it? It is a delicate process, how much you basically paint away and cover and how much you keep visible. How you accumulate a certain group of color. It is almost like creating a sound that goes with the slide. For those pieces I usually turn down the amount of pigment that I add to the resin to get more translucent lines running over the photo. Do you try to be half-way between abstraction and representation? I don’t think the division between representational and abstract is the most important way to analyze painting today, it’s more about the handmade or mechanically created vs the digital image. How far handmade it is, how many hands are in it, the questions of authorship that are raised and so on. Let’s also go back in the past of your artistic practice. You went to art school in Germany in the 1980s. Why did you decide to go to art school? Tell us about your early work. What were you concerned by at the time? How and when did your work crystallize into something significant? Were the drips your first major body of work? There have been other bodies of work before, I did a large group of oil paintings. I also worked a lot with bees wax, which is a beautiful material. I want to go back into this material as it has such a different surface quality. Now in my new studio I finally have the space for that. So when did you start to make your drip paintings? Were Gene Davis or Morris Louis an inspiration of yours? I did not know Gene Davis before I had my first show in the US. He was not well known in Europe, he was not part of the books and museum canons. For Morris Louis, I knew the work, I thought the minimal abstraction movement was very cool, so there’s definitely some influence. And also Sol Lewitt, especially for what I do when I work directly on walls. Sol Lewitt has a big impact as a groundbreaking artist here. Yes totally, if you have some patience. There has been many people producing strip artwork recently. You can find strip paintings in every art fair, from stars like Gerhard Richter to obscure artists. That was not the case 20 years ago. What do you think about that? We have a huge amount of young people that push into the art, more than ever. In the sixties, in New York, everybody knew each other in the art scene. Today in Bushwick, Brooklyn where my studio is, you can throw a stone and hit an artist! The way the system works is that if you can pay the art school you can get an art education, and schools are run as a private businesses, they do not care how many artists they produce. But then most of these people end up in some jobs somewhere. I can only guess but with everything being so easily available, people pick up things that are kind of easy, they find the mark making process cool and want to make it their own. But to truly make something your own takes some work and time and not just a copy and paste. You also accumulate letters in your titles, which are phrases with no space between words. Can you tell us why the words are attached and how you come up with these titles? Yes, it is an analogy of what I try to do in my paintings, you have to find the sense in it. To give a title makes the pieces more personal, versus giving them numbers. Lots of these titles come from music, what I listen to while I make the painting, and I combine these titles from songs but also things I pick up on the subway etc. The sound analogy to what I do is pretty obvious too. In a way you have a certain sound when the work comes together, it is very similar to music. You have to keep looking at the painting, you have to keep listening to the music, one single chord is not the song. […] I see the work that I do as an offer. You can walk away, that’s fine, or you can start thinking about lots of things and the title might push you in a direction and open some kind of imagery in your own head that might be different from mine. And that’s where the Abstract Room idea comes in, what the viewer gets out from my work depends on how far he wants to go in. In your titles and in your paintings there are no real voids, no blanks. Sometimes you can see behind the top layer, but there is another layer of work. You seem to hate voids? Yes, that’s true, you can say it like that! Every square centimeter carries information, there is no part of the painting that is not important, but I would not overestimate it either. I did this wall painting in Italy last week, and the gallerist witnessed the process and he had an idea: basically even in a big room like that, you can take a frame the size of a regular letter and move it across the wall, you always have a complete painting. Every little aspect of it makes sense. And you made some works on paper out of this experience, which confirms that your works often have a strong link between them… One last question: in which direction are you working right now? I like to allow myself to walk spirals up and down, so revisiting things of my personal history of painting is always an option. Right now I think there is more potential in the cut pieces, and as I told you I would like to go back to encaustic/bees wax. I also got myself a kiln in my new space, and I am doing ceramics, and that’s something I wanted to do for a long time. I am working on free standing ceramics and wall pieces for my next shows.